A screenshot of havenhealthcare.com. Haven is a health care venture of Amazon, Berkshire Hathaway and JPMorgan Chase. The mysterious new health care venture announced by Amazon, Berkshire Hathaway and JPMorgan Chase & Co. will be called Haven, the firm announced Wednesday. 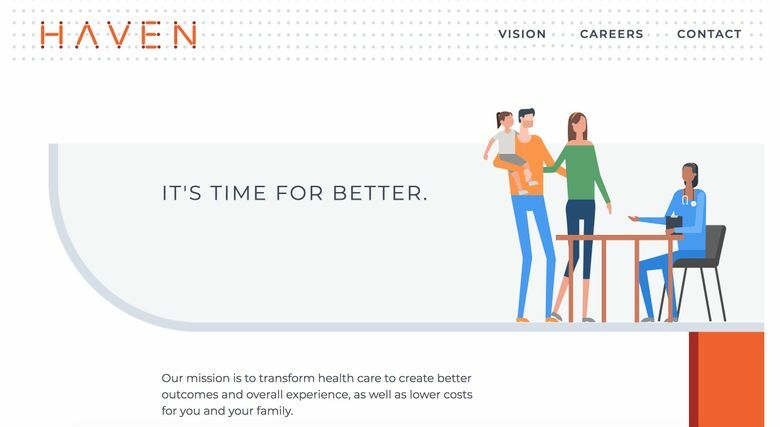 Haven also unveiled a website, havenhealthcare.com, and a letter from Chief Executive Officer Atul Gawande, a surgeon, Harvard professor and writer, who was chosen to lead the venture last June. Haven was formed because its founding companies “have been frustrated by the quality, service and high costs that their employees and families have experienced in the U.S. health system,” Gawande said in a letter posted on the website. The website is the most detailed information yet about the year-old venture that has generated excitement in the health care industry even before details of its plans were made public. It has also raised fears among health insurers, drugmakers and other parts of the industry that the giant companies backing Haven would use their collective power to disrupt established players. Gawande wrote that Haven “will be an advocate for the patient and an ally to anyone” who wants to improve patient care and costs. The company will “create new solutions and work to change systems, technologies, contracts, policy, and whatever else is in the way of better care,” he wrote. In addition to Gawande, board members of the new venture include Todd Combs, portfolio manager and investment officer at Berkshire, JPMorgan Chief Executive Officer Jamie Dimon, and Beth Galetti, senior vice president at Amazon. The companies have characterized the venture as a long-term effort that would be free from profit-making incentives and constraints. Haven will reinvest any surplus into its work, according to the website. The venture has recently been entangled in a legal conflict with UnitedHealth Group’s Optum unit. Optum sued a former employee, David William Smith, to enforce a noncompete agreement after he was hired by Haven. A federal judge in Massachusetts last month denied Optum’s motion for a temporary restraining order to keep Smith from starting work and sent the case to arbitration. NEW YORK — Amazon said Wednesday that it will shut down all its pop-up shops and focus on opening more of its bookstores as it rethinks its brick-and-mortar strategy. Amazon has been making a big push into brick-and-mortar stores, buying up the Whole Foods grocery chain, opening 19 bookstores and 10 cashierless convenience stores around the country. But sales at its physical stores slipped 3 percent in the last three months of 2018, compared with the same period the year before. Besides opening more bookstores, Amazon said it also plans to expand its 4-star stores beyond the three it has now. The 4-star stores, which it began to open last year, sell a mix of products including cookware and toys. “All things considered, stores are better than being online” because people can see and touch products they want to buy, said Simeon Siegel, a retail analyst at Instinet, an equity research firm. Closing the pop-up stores shows that Amazon is learning and still shaping its strategy, Siegel said. Such stores typically have flexible leases and offer easy ways to experiment. “The pop-up store was born to be a test, and it appears to be they are using this to optimize their retail strategy,” Siegel said.